Police outside Blake's nightclub in Gravesend yesterday. KENT POLICE HAVE charged a man with attempted murder after a car was driven into a nightclub in Gravesend, Kent on St Patrick’s Day. At around 11.47pm, Kent police responded to a call that a Suzuki Vitara car had collided with people on the dancefloor of Blake’s nightclub in Queen Street, Gravesend. At least 13 people have been reported injured in the incident. Most of the injuries were broken bones and none were life-threatening. Police said there could be more people who were injured in the incident. A man was arrested at the scene, and this afternoon police charged 21-year-old Mohammed Abdul of McMillan Street, London with attempted murder. He is due to appear before Medway Magistrates’ Court today. The incident is not being treated as terror-related. 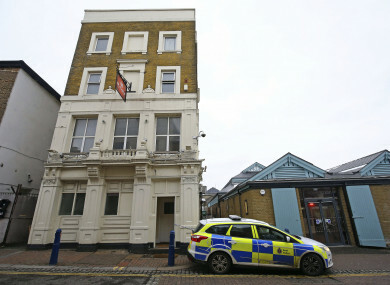 Senior investigating officer Detective Chief Inspector David Chewter from the Kent and Essex Serious Crime Directorate said the man had been kicked out of a nightclub before incident. Footage posted on social media showed a large car on a dance floor inside a marquee tent at Blake’s nightclub. On Facebook, the club thanked “the heroic actions of our door team and guests to apprehend the individual before further harm was caused”. “I’d like to take this opportunity to thank the security staff at the nightclub as well as those members of the public who helped in the initial moments after the collision. However, we believe there may be more casualties out there who are yet to come forward and talk to us – we would like to hear from them as we continue to build a clear picture of what happened that night. Email “Man (21) charged with attempted murder after car rams into Kent nightclub”. Feedback on “Man (21) charged with attempted murder after car rams into Kent nightclub”.